VILLA ULTIMA is a 'MAGAZINE COVER' home. This custom-built LUXURY VILLA features an open floor plan with a grand 23 foot two-story high 'Great Room' and kitchen area that totally opens through sliding glass doors to the lanai and large heated pool (electric & solar heat). Located 7 houses east of Chiquita on SW 58th St in exclusive Southwest Cape Coral, Villa Ultima is adjacent to the new Cape Harbour development with marina, 3 restaurants, shopping, and entertainment within a 3 minute walk. This location on a wide canal with a large dock provides sailboat and powerboat access to open water in less than ten minutes. There are no bridges or locks blocking your access to the Gulf which takes about in 10 minutes or less by boat to Tarpon Point Marina and the Westin Hotel. There are great boats available in the area at very good prices and most will deliver to our dock. You will need to reserve a boat well in advance during the high season. Decorator furnishings, gourmet kitchen, formal dining room, and media room with full audio/visual components make this a house for total entertainment. Four widescreen HDTV's, 4 DVD's including 1 Blue Ray and 2 VCR's with free cable access to all premium channel including sports channels, plus 5 wireless phones, fax, and Dell computer and laser printer with free high speed Cable Internet access with a 4 port Linksys router and Wi-Fi access complete your home in paradise. The first of 2 large safes located in the Kitchen Store Room allows guests to set the lock/unlock code for your valuables, laptops, etc. The Master Bedroom located on the upper floor off the mezzanine has a king bed and a large bathroom with a shower as well as a Jacuzzi tub. The second of 2 large safes located in the Master Bedroom Closet allows guests to set the lock/unlock code for your valuables, laptops, etc. The gound floor has the second and third ensuite bedrooms, a guest bathroom and the rest of the living space. The second bedroom also has a king-size bed and 'en suite' bathroom with shower. The third bedroom has a king size bed and also an 'en suite' bathroom with shower. The fourth bedroom located on the upper floor next to the masterbath has a queen bed providing comfortable total accommodations for eight people. There is also a day bed with a pull out trundle bed that sleeps 2 more on the mezzanine as well as a couch on the mezzanine that holds a foldout twin bed for an eleventh person. The fourth bathroom (guest bath) including a shower is located between the second and third bedroom on the ground floor and has access from the main living area as well as the pool/lanai. english, german, Our housekeeper speaks German fluently. 4 bathrooms (3 ensuite) with showers and a jacuzzi tub in the master bathroom. 2 large safes available for laptop and large item storage 20" x 12" x 14"
Two air conditioners with separate controls for each side of the home. Two heating systems with separate controls for each side of the home. New style LG Duet with extra large capacity front loading on pedestals. New style LG duet extra large capacity front loading on pedestals. 2 car garage available plus 50 ft x 20 ft driveway accommodates several vehicles. 2 car garage with remote opener provided. High speed wifi available in the entire villa. 12 large beach towels, 8 large bath towels and washcloths for each of the 4 bathrooms (32 sets total). High speed wifi available in the entire villa and lanai. (2) Both are large double door refrigerator/freezers and both have automatic icemakers. Gourmet kitchen complete with nearly all the utensils needed for extensive cooking; also a wet bar with various glasses including wine glasses. There are 2 dining area, the formal area seats 6 to 8 plus the kitchen area seats 4 or more. Also the lanai can seat 8 to 10. 4 widescreen HDTVs located in the Media Room, Master Bedroom, pool bedroom and front bedroom. All have free cable service with all the premiun channels including 'on demand' movies and programs. Over 100 discs are available including Oldies, Country, Rock, Jazz, Raggae, pop & Standards. Some pool toys and pool noodles. Some are available at the villa and a Blockbuster video rental store is 1 mile away. Balcony off the master bedroom upstairs overlooks the canal. 2 bicycles with cable locks, 8 beach chairs, 2 beach umbrellas and 12 beach towels. We will send you boat rental information and websites. Boat launching ramp is available at Cape Harbour Marina for $10 each way and is located at the end of our street across Chiquita Blvd. Large dock deck can accommodate 2 boats and has small tables and 4 - 6 chairs for relaxing, fishing and sunning. Many guests visit just to pay at the many golf courses in the area. Ground floor accessible with 1 step up to the ground floor which includes all areas except the master bedroom, master bathroom and 4th small bedroom. 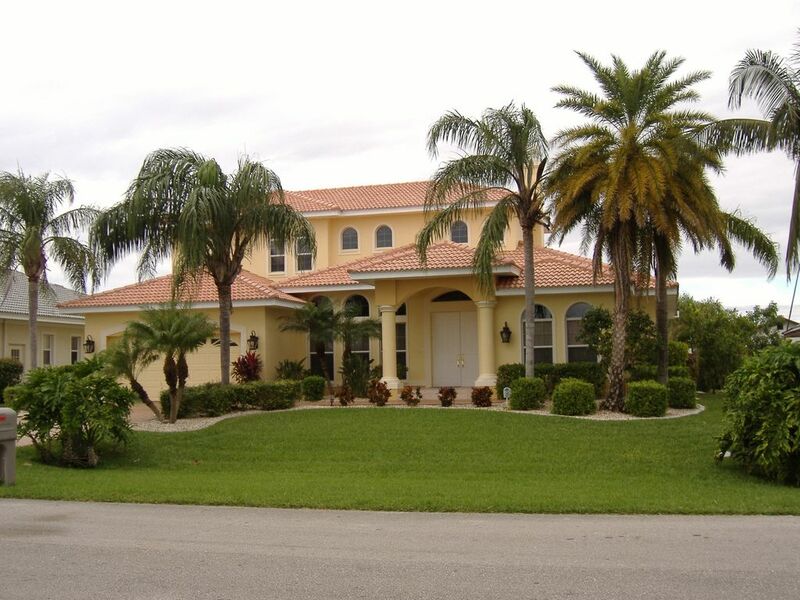 Our pool is approximately 30 ft x 14 ft and is probably the largest pool of any home we have rented for ourselves and probably in the top 5 of all the rentals in Cape Coral. The pool is 6 ft deep in the center and 3-4 feet deep at both ends which allows good pool volley ball. 4 widscreen cable HDTV's with free cable including all the premium channels and sports channels, 4 DVD's, 2 VCR's, 2 CD Players, 5 wireless phones, Full Gourmet Kitchen, extensive Cooking Utensils, Complete Linens including Pool Towels (12), Jetted Tub in Master Bath, Private Solar & Electrically Heated Pool, fishing poles (4), Beach Chairs (4) & Beach Umbrellas (2), 2 Car Garage. Jane D.Where do you live? We can't say enough good things about this wonderful home and its owners, Ed and Karen. From the very beginning when we booked this home to the very end when we locked the door behind us, it was a smooth experience. The home is supplied with everything one would need to feel at home. Nicely stocked kitchen, private pool area, media room and sound system, and comfortable bedrooms. Our family of 6 adults and two children (3 and 8) fit beautifully here and made some great vacation memories. We rented a boat for the week and went fishing and beach hopping. The pool is lovely and was the perfect temperature. Ed and Karen were readily available via phone or email for any questions we had. The family agreed that this was the nicest home we have ever rented and it fit our lifestyle perfectly! Thank you for sharing it! The home had looked nice on line, but when we walked in, WOW. VERY nice. We have 8 adults (4 couples) and often have difficulty finding a home with 4 bedrooms and baths. The 2 master bedrooms on the main floor, a well supplied kitchen, 3 different places to eat or play cards, and the wonderful, private pool made the stay fabulous. We had met a local who gave us places to eat - Duffys, Finns, Lobster Lady, Fathom (a short walk) and Pinchers. We had great meals at all of them. The weather was in the low 80's all week. Ed and Karen's house is a winner. This is an incredible special home. It not only gives you all of the comforts of your own home, but transcends you in comfort and beauty. The location is outstanding for boating and walking to your favorite restaurants. Villa Ultima was a perfect choice for our family! There is plenty of room.for larger groups. Ed and Karen put a lot of thought into this house and paid great attention to detail. It is equipped with anything you might need during your stay. It was nice to have beach chairs, umbrellas and coolers available for our trip to the beach and the kids enjoyed the awesome pool and toys. Several nice restaurants are within walking distance. You will not be disappointed with this house. This property was simply perfect. It is a beautiful house and it is well stocked with every thing you can image. The linens were 5 star hotel quality. The kitchen had every amenity you can imagine. I was able to cook a turkey on Christmas day and never wanted for anything. I could set a table including linens and lovely dishes. We went to the beach and had beach chairs, umbrella and even beach toys for the children. The owners checked in with us to make sure we had everything we needed for a wonderful holiday. The house even had colored lighting that added to the ambiance. There was no skimping on anything. The house is beautiful, well stocked and accommodated my family of 11 beautifully with plenty of space. The pool was even heated to a toasty 90 degrees. This is a fabulous rental! You will not be disappointed at all in renting this home. From unlocking the door to our time to leave brought so many memories. We will rent this home again. The only thing we found sad about this home was when we had to leave to come home to Michigan. Anytime we needed anything, Ed or Karen were only a phone call away. They make you feel like family. This home had anything and everything you could possibly need or want. The pool lights at night to the music playing when we arrived throughout the house was something unexpected and very easy to fall in love with. The new upscale 'Rumrunners Restaurant' located in the new Cape Harbour Marina is less than a 5 minute walk from Villa Ultima and provides indoor or outdoor dining while watching for Dolphin and Manatee while dining. Ten minute drive to the new Tarpon Point resort with a new hotel, marina, boat rentals, excursion tours, restaurants and shopping.